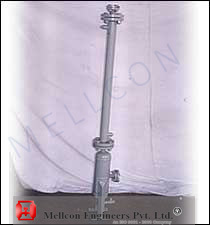 Mellcon compressed air aftercoolers are high performance shell and tube heat exchangers coolers connected to a moisture separator and a drain trap. All after coolers are individually stage wise inspected as per IS-2825/ASME/TEMA standards. The tubes used are high quality copper / cupro nickel/SS/ carbon steel as per user's requirement. All flanges and tube sheets conform to ANSI B 16.5 standards. The capacity of the after coolers are ranging from 10 CFM to 10,000 CFM working pressure up to 150 kg/cm² (g) which will be ready for installation with air/gas inlet/outlets and water inlet/outlet nozzles. All above capacities are at a pressure of 8.0 bar. For other pressures and higher capacities, please contact us.